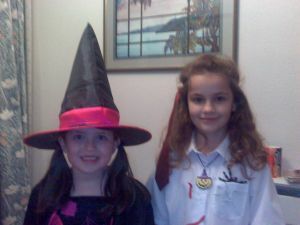 Who should come knocking on our front door this dark Halloween night but two scary young witches that might just have been Nicole and Natalia from over the road. This entry was posted on Tuesday, October 31st, 2006 at 6:26 pm and is filed under My life & thoughts. You can follow any responses to this entry through the RSS 2.0 feed. Responses are currently closed, but you can trackback from your own site.